What an awesome read! I was pleasantly surprised by For Real. It's so fun and relatable; definitely the perfect fast-paced Christmas break read. It has a great balance of humor and realism, and there's a great variety of characters. I love the main character Claire! I really like her journey to overcome her fears. I also love that she accepts herself for who she is. Plus, she's a nerd, which is freakin' awesome - there are even a couple references to Doctor Who and Joss Whedon! And her explanation for why people like reality TV is so cool; I had never thought about it that way before. The relationships in this book just had so much win. The relationship between Claire and her sister is perfectly imperfect. Yes, they get on each other's nerves a LOT but in the end they stick up for each other. I love how the author handled Claire's feelings of inadequacy when compared to her sister, and how eventually she learns to stand on her own. Secondly, there's the relationship between Claire and the love interest, Will. I don't want to say a lot about this because that would include lots of spoilers. But suffice it to say, it is so realistic. I felt Claire's emotions every step of the way and cheered at the ending. The plot is super exciting! Thanks to the competition taking place, there is always something happening. I laughed at all the awkward situations poor Claire has to go through, and I love how all the minor characters stood out. There's also plenty of twists! And a certain scene at the end had me grinning the whole time. The best way to describe For Real is that it's (pardon the pun) very real. With a storyline like this, it could easily be cheesy, but this book is refreshingly realistic and features well-written relationships and fantastic character development. 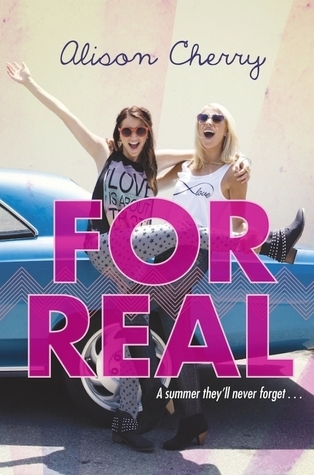 For Real is definitely worth your time. I can't wait to check out the author's first book!